This is the first game in the Spore series. For other games in the series see the Spore category. For the unrelated Commodore 64 and ZX Spectrum game, see Spore (Mastertronic). For the unrelated MS-DOS game, see Spore (DOS). 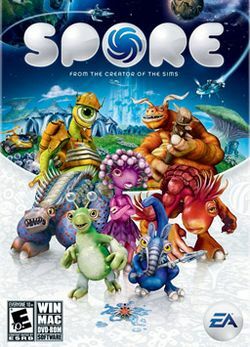 Spore is a god game by Maxis and designed by Will Wright that allows the player to control the evolution of a species from its beginnings as a multicellular organism, through development as a sapient and social land-walking creature, to levels of interstellar exploration as a spacefaring culture. The game has drawn wide attention for its massive scope, and its use of open-ended gameplay and procedural generation. Spore was released on September 4, 2008 in Australia, September 5 in Europe, and September 7 in North America. To promote the game, the Creature Creator portion was released separately as Spore Creature Creator. Two spin-offs were released around the same time as the main game: Spore Creatures for the Nintendo DS, and Spore Origins for the iPod, iPhone, and mobile phones. There is also a Wii spin-off called Spore Hero, released on October 6, 2009. An expansion pack was released recently called Spore: Galactic Adventures. Spore allows players to create their universe by evolving a creature through five stages. Cell. Your creature is a cell that has just emerged from a crashed comet. Advance by eating food and avoiding predators. Creature. Having come out of the ocean, land is the next frontier, make friends with other species or make food of them. Upgrade your abilities and earn enough points to get to the next stage. Tribe. Control a society of creatures and interact with other tribes by attacking or befreinding them. Once you've taken control of five tribes, you advance to the next level. Civilization. The goal is to unite your planet through one of three methods. Conquer your rivals, convert them or simply buy them out. Space. You've reached the stars but that isn't the end. There's so much to do in space interact with other empires or simply create your own planets. For players that reach the center of the galaxy, there's a special surprise waiting for them. Spore is completely made of player-made creations. Whenever something is created, it's uploaded and downloaded by other players. This is happening all the time you're online and playing Spore. What you can create includes. Cells:Cells can be created but aren't uploaded to the web. Creatures: You can create them in one of two editors. An initial creature editor and an evolved creature editor. Outfits: Outfits can be accessed in one of three editors corresponding to the tribe, civilization and space stage. Buildings: Create city halls, houses, factories and entertainment buildings. Vehicles: Create land, air and sea vehicles in economic, religious or military categories. In all nine separate editors. Spaceships: No limits on this editor, with all the vehicle parts as well as some new spaceship parts, let your imagination run wild. Anthems: An editor in the civilization stage and space stage, you can even create and save your own music. Plants: A hidden editor in beta stage, you can access it by changing the shortcut parameters. This page was last edited on 26 August 2016, at 21:42. This page has been accessed 32,148 times.